Seasonal Sweetheart: A delicious dessert! Chilled soups are delicious on spring or summer night. This cherry soup is a little unusual, but once you taste it you will definitely be craving more. I made this soup for an event and it was the hit of the night. Its the perfect balance of tart and sweet. It makes a gorgeous presentation in shot glasses or a shallow bowl. As an added bonus, this soup could not be easier to make. This will become a regular dessert in your rotation! Place cherries in crockpot with water and their juices. Make sachet with cinnamon stick and add to stockpot. Add lambic, lemon juice, and salt. Simmer until cherries are tender 10-15 minutes. Chill and let sit overnight. Remove half the cherries to save for garnish. Remove sachet of cinnamon and add almond extract and heavy cream. Puree all ingredients until smooth. Garnish with reserved cherries and heavy cream. If you want to make this dish gluten free use the cherry juice instead of the lambic. 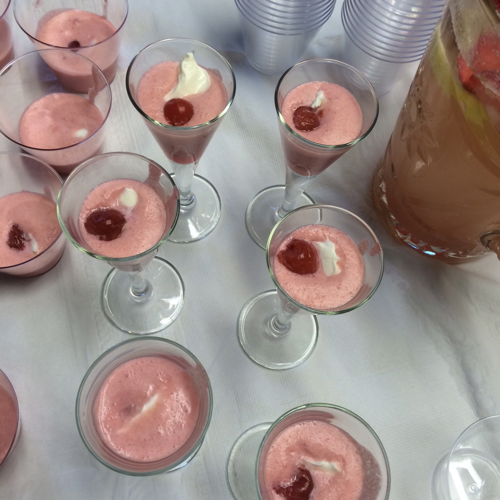 A clever presentation for cherry soup! Cheese puffs for a crowd! A magnificent butternut squash soup!